Chris attended the Junior Royal College of Music and read Music at Clare College, Cambridge, where he studied composition with Robin Holloway. 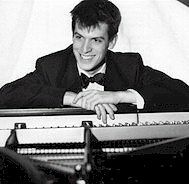 Graduating with First-class honours, he won the University’s Donald Wort prize for his degree recital. He then completed a Master’s degree in piano performance at the Royal Academy of Music and was awarded a Distinction by the University of London. Chris has played at venues around the UK, at St. John’s, Smith Square, in France, Hungary, Austria and Germany, and on Classic FM. As a concerto soloist he has performed in the Royal Albert Hall and with the New London Orchestra. Future engagements include both Rachmaninov’s 2nd and 3rd Piano Concertos. As a composer, Chris has collaborated on numerous joint projects with Susan Haire and Nils Schweckendiek since 1998, giving many of the pieces their first performances. Having studied the piano with Aaron Shorr for many years, he now learns with Hamish Milne. In between his other commitments, Chris now deputizes for Aaron Shorr as a piano professor at the Junior RCM, and is a tutor of fugal composition at Clare College. He returned to Clare College last year and has just completed an M. Phil and started a PhD in musicology on Domenico Scarlatti.